My first pair or proper HiFi speakers, after my education regarding exaggerated bass on speakers marketed to teenagers! I was 17, and I kept these around 7 years - which was itself some time ago. These were great with the budget electronics I used at the time - a small Rotel amplifier and a Marantz CD5000 I think. The best thing I remember was a really nice open mid range. Not the tightest presentation though.. I'm into percussive music, and I remember the Tannoy/Rotel combo spitting out drums, which - even if in hindsight they were probably compressed and I couldn't hear the attacks and decays properly - was a lot of fun! Having owned.a set of Tannoy M1s a number of years ago and having used various speakers from Mission and Wharefedale i bought a pair used MX2s off ebay at a pretty good price. Did i make a good choise ? You bet these speakers are really fantastic the sound quality for the money is second to none.Trust me you will not be diassapointed and of course being made by a Scottish company makes them even more special.Thet just play all types of music very well and do it in a very natural and realistic fashion full stop. Beautiful bass even at low volumes. That "Easy-Listening", non-fatiguing quality that makes you want to listen to more music... Enough "Punch" and definition for HT use. Setup: Yamaha RX-V740 Pioneer DV-360S now replaced by Philips DVP720SA 2,5 sqmm multi-stranded speaker cables (OFC) I bought these after reading reviews which said they would probably be a good match for my Yamaha 740 receiver. Having a pair of B&W 602 S2 from before I also had the chance to put the Tannoys on top of the 602's to do some A-B testing. Right out of the box they sound great, and even though smaller than the 602's seemed to be more willing to play bass. The sound also improved some further after a month or so of playing, to the point where I decided these were clearly better than the 602 S2's and deserved to be kept, while selling off the 602's. The 602 is by no means a bad speaker, mind you, the treble being a bit sweeter, but overall it needs a bit more juice (volume) to bring out the best - which is not compatible with late night listening. I also later bought the mXC centre speaker and this matches the mX2's exactly, being actually very good for both CD and home theatre use. However I also discovered with the mX2's that they had even more bass in them than I thought. I didn't think a new DVD player would make that big a difference, but actually it did. The old player had no selection for type of speaker or frequency. The new DVD player I just bought had selection for Big or Small speakers. The Small=cutoff at 120 Hz and here the sound was not that different from the old DVD player. But setting the selection to Large (because the mX2 DO go a lot lower than 120 Hz) - whoa! what a difference! It totally revitalized the speakers in the bass region, so they now sound even bigger and more authorative. The amount of bass is almost incredible from a speaker this size (at least in this price range). So that is a clear tip for anyone buying a DVD player now - check that it can be configured to output the low frequencies also, and does not cutoff at 80-120Hz for example. (Probably most relevant to check this for budget players). So conclusion is that I'm very pleased with these speakers. Beautiful bass, accurate mid-range, good treble and overall a fine musicality. Do take care to mount them on standmounts or in "ear-height" - they clearly deserve good placement. Another recommendation is to remove the foam-bungs, the speakers really "breathe" more easy without them. Bought this pair a month ago as my front. 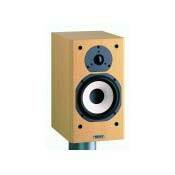 I would directly say that I've made the right decision in opting for Tannoy... I've been comparing it to other same-price-level brands but the tannoy seems to have an edge. Been playing music nighly an hour or two and it seems to deliver a relaxing none fatiguing reproduction, the vocals come alive, the instruments are in place... and the BEERs are ice-cold... ahhh this is life :) Sometimes its difficult to spot a gud product at the first time (been lucky i guess), a careful/thourough product research and comparison is very crucial especially if you're spending hard-earned cash. With the MX2, I think I have a slim room for an upgrade. My Setup: AVR: Onkyo TX-SR601 Front: MX2 (bi-wired) Rear: MX1 Center: MXC Sub: Velodyne VX10 Gud luck & enjoy. A bargain for the price. Great high and Mid range. Bass 7.5 out of 10, but then i'm using them without stands. Amazing clarity. I use them as my primary speakers and run them through Onkyo TXDS474 Reciever. I ultimately plan to use them as rear/surround speakers when ican afford floorstanding fronts. Beautifully clear, detailed sound that lets the music do the talking. Great looking with or without grills (personal choice, of course). Handles all music with assurance - shines for classical and jazz. Will not offer the pounding, moronic bass for heavy dance and D&B - but who cares - buy them anyway and get a sub!!! Wow - what a fantastic pair of speakers!! After many long hours of research, which included web reviews, manufacturers websites, shop advice and trials of other speakers including Wharfedale 8.1's, 8.2's and Mission M72's, I decided to go for the Tannoys. These offer a perfect compromise in terms of size and looks (being neither too obtrusive or withdrawn - they are modern without being too 'trendy'). In terms of sound quality, at this price there is absolutely no compromise - they play almost all music beautifully. The mid range and the treble is bright, distinctive and very clear - I have found these simply wonderful for classical music and jazz - allowing every detail to be presented clearly. For dance music with a heavier beat and bass they shine too, with the speakers offering deep, clear bass with no 'pounding' or loss of detail- For dance /trance and drum and bass 'clones' there may be more suitable speakers - but lets face it , if thats all you listen to then you could never appreciate this speakers refinement! It is simply for MUSIC lovers - handling classical, jazz, rock , pop and dance with equal aplomb. If you are seeking a sub £180 speaker for a broad range of music, in my opinion YOU WILL NOT BETTER THESE TANNOY'S - YOU SIMPLY HAVE TO TRY THEM!! At about £100 they are givaways!! I bought these speakers after reading many many reviews about speakers. I can't say I could be more pleased. I love these things.